We know OEL means original English language as regards to manga produced by Americans. 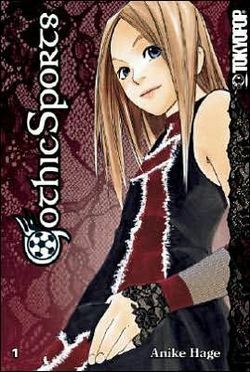 Does that mean Gothic Sports, TOKYOPOP’s latest entry in their Global Manga initiative, is OGL – original German language – because it is produced by German mangaka, Anike Hage? Labels aside, it’s darn good first manga series (which was originally published by TOKYOPOP of Hamburg, Germany). 16-year old Anya has transferred to Lucrece High for one reason – its elite sports teams. Things are off to a good start when she discovers that an old friend, Luise or Loo, will be a classmate, and then, some of the other girls immediately take to her. However, Anya makes an instant rival in Marie, a basketball player on the schools hot B-ball team. That’s a problem because it hampers Anya’s shot at playing ball on the team. Things keep going downhill for Anya when she discovers that Leon, an old boyfriend, is also a student at Lucrece High. Anya takes things into her own hands and forms the schools first girls’ soccer team, but except for a small band of hearty sisters, the school ignores them. When Anya gets the notion to use Goth style in designing the team’s uniforms, the team gets a little more attention. Some of this new found interest they won’t like, especially when Leon and Marie’s homegirl, Delia, want to get in on the action. As an illustrator, Hage is a good, but not great storyteller and her draftsmanship and ability to cartoon the human figure is still a bit raw. She makes up for it with that saving grace of fictional concepts that have an imperfection here or there – great characters. Students, rivals, school administration: they all have flavor. Hage gives even the bit players a moment or two to shine, and that’s just what good writers – be they novelists, screenwriters, dramatists, etc. do. Hage’s potential is so obvious here, and I’m excited about her and this new work. Gothic Sports is one of those fun high school fantasies that makes you wish high school was really like that. 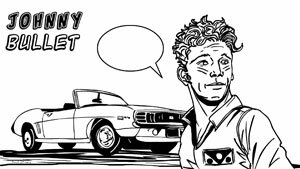 Readers who like OEL or indie graphic novels may very well dig this. I look forward to the next two volumes of Gothic Sports and hope this is sign of bigger and better things to come from Anike Hage. Thanks to barnesandnoble.com for the imageS. The Comic Shop Locator phone number is 1-888-COMIC BOOK.